© Copyright 2019 Nero AG unless specifically noted otherwise. Nero, Nero BackItUp, Nero Burn, Nero Digital, Nero Express, Nero MediaStreaming, Nero Recode, Nero RescueAgent, Nero SmartDetect, Nero Simply Enjoy, Nero SmoothPlay, Nero StartSmart, Nero Surround, Burn-At-Once, LayerMagic, Liquid Media, SecurDisc, the SecurDisc logo, Superresolution, UltraBuffer, Nero Burning ROM, Nero Kwik Blu-ray, Nero Kwik Media, Nero Kwik Burn, Nero Kwik HD Burn, Nero Kwik Play, Nero Kwik DVD, Nero Kwik Photobook, Nero Kwik Faces, Nero Kwik Move it, Nero Kwik Sync , Nero Kwik Mobile Sync, Nero Kwik Themes, Nero Kwik Home Streaming, Nero Video, Nero Video Express, Nero SoundTrax, Nero WaveEditor and Nero CoverDesigner are common law trademarks or registered trademarks of Nero AG. Gracenote, CDDB, MusicID, MediaVOCS, the Gracenote logo and logotype, and the "Powered by Gracenote" logo are either registered trademarks or trademarks of Gracenote in the United States and/or other countries. Manufactured under license from Dolby Laboratories. Dolby, Pro Logic, and the double-D symbol are registered trademarks of Dolby Laboratories, Inc. Confidential unpublished works. Copyright 2011 Dolby Laboratories. All rights reserved. AVCHD and AVCHD logo, AVCHD Lite and AVCHD Lite logo are trademarks of Panasonic Corporation and Sony Corporation. Yahoo! and Flickr are registered trademarks of Yahoo! Inc.
Google, Android and YouTube are trademarks of Google, Inc.
Apple, Apple TV, iTunes, iTunes Store, iPad, iPod, iPod touch, iPhone, Mac and QuickTime are trademarks of Apple Inc. registered in the U.S and other countries. Blu-ray Disc, Blu-ray, Blu-ray 3D, BD-Live, BONUSVIEW, BDXL, AVCREC and the logos are trademarks of the Blu-ray Disc Association. DVD Logo is a trademark of Format/Logo Licensing Corp. registered in the U.S., Japan and other countries. Bluetooth is a trademark owned by Bluetooth SIG, Inc. The USB logo is a trademark of Universal Serial Bus Implementers Corporation. ActiveX, ActiveSync, Aero, Authenticode, Bing, DirectX, DirectShow, Internet Explorer, Microsoft, MSN, Outlook, Windows, Windows Mail, Windows Media, Windows Media Player, Windows Mobile, Windows.NET, Windows Server, Windows Vista, Windows XP, Windows 7, Xbox, Xbox 360, PowerPoint, Silverlight, the Silverlight logo, Visual C++, the Windows Vista start button, and the Windows logo are trademarks or registered trademarks of Microsoft Corporation in the United States and other countries. FaceVACS and Cognitec are either registered trademarks or trademarks of Cognitec Systems GmbH. DivX and DivX Certified are registered trademarks of DivX, Inc.
NVIDIA, GeForce, ForceWare, and CUDA are trademarks or registered trademarks of NVIDIA. Sony, Memory Stick, PlayStation, and PSP are trademarks or registered trademarks of Sony Corporation. HDV is a trademark of Sony Corporation and Victor Company of Japan, Limited (JVC). Adobe, Acrobat, Reader, Premiere, AIR, and Flash are trademarks or registered trademarks of Adobe Systems, Incorporated. AMD Athlon, AMD Opteron, AMD Sempron, AMD Turion, ATI Catalyst, ATI Radeon, ATI, Remote Wonder, and TV Wonder are trademarks or registered trademarks of Advanced Micro Devices, Inc.
UPnP is a registered trademark of UPnP Implementers Corporation. InstallShield is a registered trademark of Macrovision Corporation. Check Point is a registered trademark of Check Point Software Technologies Ltd.
LightScribe is a registered trademark of the Hewlett-Packard Development Company, L.P.
Intel, Intel Media SDK, Intel Core, Intel XScale and Pentium are trademarks or registered trademarks of Intel Corporation in the U.S. and/or other countries. MP3 SURROUND, MP3PRO and their logos are trademarks of Thomson S.A.
Other product and brand names are trademarks of their respective owners and do not imply affiliation with, sponsorship, or endorsement by owners. Links to Nero AG sites are welcome as long as they are done so in a way such that the ownership of the page is not in question. This use includes but is not limited to the use of "branding"-style framing to present pages directly. We&apos;d appreciate it if you&apos;d let us know about the links, too so we can stay aware of those who appreciate our work and material. 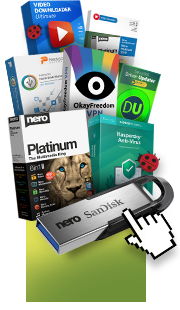 Any software that is made available to download from this server ("Software") is the copyrighted work of Nero AG. Use of the Software is governed by the terms of the End-User License Agreement , if any, which accompanies or is included with the Software ("License Agreement"). Use of this product is subject to the acceptance of the End-User License Agreementupon installation of the software. The Software is made available for downloading solely for use by end users according to the License Agreement. Any reproduction or redistribution of the Software not in accordance with the License Agreement is expressly prohibited by law, and you may be subject to payment of damages and other remedies. Violators will be prosecuted. THE SOFTWARE IS WARRANTED, IF AT ALL, ONLY ACCORDING TO THE TERMS OF THE LICENSE AGREEMENT. The copyright notice below appears in all copies and that both the copyright notice and this permission notice appear. © 2019 Nero AG, Karlsruhe, Germany. All rights reserved. Use of documents and related graphics available from this Server is for informational and non-commercial or personal use only. No documents and related graphics available from this Server are modified in any way. No graphics available from this Server are used separately from accompanying text. NERO AG AND/OR ITS RESPECTIVE SUPPLIERS MAKE NO REPRESENTATIONS ABOUT THE SUITABILITY OF THE INFORMATION CONTAINED IN THE DOCUMENTS AND RELATED GRAPHICS PUBLISHED ON THIS SERVER FOR ANY PURPOSE. ALL SUCH DOCUMENTS AND RELATED GRAPHICS ARE PROVIDED "AS IS" WITHOUT WARRANTY OF ANY KIND. NERO AG AND/OR ITS RESPECTIVE SUBSIDIARIES HEREBY DISCLAIM ALL WARRANTIES AND CONDITIONS WITH REGARD TO THIS INFORMATION, INCLUDING ALL IMPLIED WARRANTIES AND CONDITIONS OF MERCHANTABILITY, FITNESS FOR A PARTICULAR PURPOSE, TITLE AND NON-INFRINGEMENT. IN NO EVENT SHALL NERO AG AND/OR ITS RESPECTIVE SUBSIDIARIES BE LIABLE FOR ANY SPECIAL, INDIRECT OR CONSEQUENTIAL DAMAGES OR ANY DAMAGES WHATSOEVER RESULTING FROM LOSS OF USE, DATA OR PROFITS, WHETHER IN AN ACTION OF CONTRACT, NEGLIGENCE OR OTHER TORTIOUS ACTION, ARISING OUT OF OR IN CONNECTION WITH THE USE OR PERFORMANCE OF INFORMATION AVAILABLE FROM THIS SERVER. THE DOCUMENTS AND RELATED GRAPHICS PUBLISHED ON THIS SERVER COULD INCLUDE TECHNICAL INACCURACIES OR TYPOGRAPHICAL ERRORS. CHANGES ARE PERIODICALLY ADDED TO THE INFORMATION. NERO AG AND/OR ITS RESPECTIVE SUBSIDIARIES MAY MAKE IMPROVEMENTS AND/OR CHANGES IN THE PRODUCT(S) AND/OR THE PROGRAM(S) DESCRIBED AT ANY TIME. NERO AG RESERVES THE RIGHT TO CHANGE PRICES AND SPECIFICATIONS WITHOUT NOTICE. NERO AG AND/OR ITS SUPPLIERS ARE NOT RESPONSIBLE FOR ERRORS (TYPOGRAPHICAL OR OTHERWISE) IN ITS SPECIFICATIONS, PRICE LISTS, OR OTHER INFORMATION PROVIDED ON ITS SERVERS. IN NO EVENT SHALL NERO AG AND/OR ITS RESPECTIVE SUBSIDIARIES BE LIABLE FOR ANY SPECIAL, INDIRECT OR CONSEQUENTIAL DAMAGES OR ANY DAMAGES WHATSOEVER RESULTING FROM LOSS OF USE, DATA OR PROFITS, WHETHER IN AN ACTION OF CONTRACT, NEGLIGENCE OR OTHER TORTIOUS ACTION, ARISING OUT OF OR IN CONNECTION WITH THE USE OR PERFORMANCE OF DOCUMENTS, PROVISION OF OR FAILURE TO PROVIDE SERVICES, OR INFORMATION AVAILABLE FROM THIS SERVER. Any Software which is downloaded from this Server for or on behalf of the United States of America, its agencies and/or instrumentalities ("U.S. Government"), is provided with Restricted Rights. Use, duplication, or disclosure by the U.S. Government is subject to restrictions as set forth in subparagraph (c)(1)(ii) of the Rights in Technical Data and Computer Software clause at DFARS 252.227-7013 or subparagraphs (c)(1) and (2) of the Commercial Computer Software - Restricted Rights at 48 CFR 52.227-19, as applicable. Manufacturer is Nero AG, Rüppurrer Strasse 1a, 76137, Karlsruhe, Germany. Use of Nero AG sites implies acceptance of these policies. If you have any questions concerning this copyright notice, please contact us! ©2019 Nero AG, Karlsruhe, Germany. All rights reserved.